La Gran Villa in Sayulita, at Villa Amor, where elegance meets the beach. Inquire how you can live the Sayulita magic by utilizing the contact form, either by email or by telephone. Our reservation specialists are standing by to assist you with your every need. Experience Sayulita and the stunning beauty of its unspoiled bay from the most spectacular location right at the ocean’s edge. La Gran Villa de Amor and Villa Paraiso at Villa Amor can be combined to provide the perfect oceanfront luxury retreat for families and groups who are looking for a private location with premium resort amenities and service. 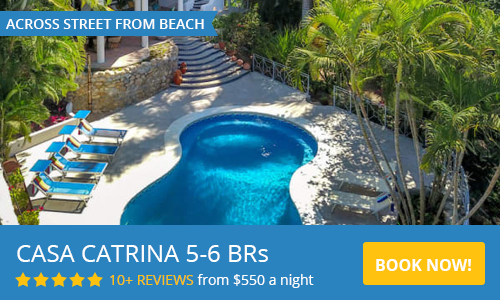 These stunning Sayulita villas can comfortably accommodate up to 15 guests in a total of 9 bedrooms with a magnificent terrace and a trendy combination of outdoor and indoor living space. The expansive terrace in La Gran Villa features an infinity pool, Jacuzzi, lounge chairs and surround sound system to ensure many hours of entertainment or simply provide the perfect ambiance to relax and enjoy the breathtaking views of the ocean right in front of you. The Villas can also be rented separately to accommodate smaller groups. It’s hard to imagine a more beautiful setting than Sayulita and Villa Amor for a special family occasion, your Sayulita destination wedding, or a getaway with friends who enjoy the finer things in life. If you can’t live the life you love while you’re staying in La Gran Villa de Amor, well…may we suggest you see a doctor as soon as you get home. Attentive staff see to your every need. You can hear the sounds of the ocean and watch the sunset over the Pacific while you unwind and enjoy the perfect combination of old-world authenticity and modern conveniences in this breathtaking Sayulita retreat. Please view our Wedding and Event Venue page for more information. 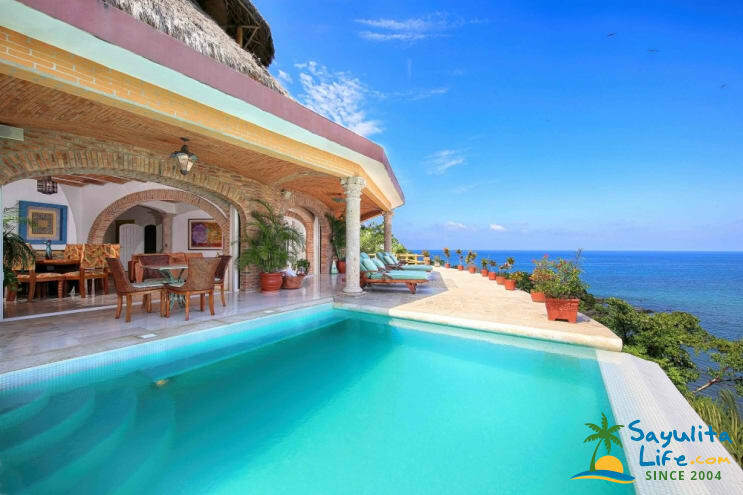 La Gran Villa, designed to delight every guest with its breathtaking expansive ocean views and enchanting oversized spaces full of color and comfort, this Sayulita villa accommodates up to 6 guests with three luxurious bedrooms and three and one half bathroom. Its unique entrance framed by lush landscaped gardens and tropical palm trees, leads you to this unique villa as you pass by the spacious front patio and its beautiful stone fountain preparing the perfect ambience for oceanfront stylish living as you access the villa and make your way out to the stunning terrace. Activities (on site and nearby) From A to Z: Adventure travel, Bird Watching, Culinary Classes, Diving, Fishing, Golfing, Hiking, Horseback riding, Kayaking, Nightlife, Sailing, Snorkeling, Stand Up Paddleboarding, Surfing, Swimming, Whale Watching, Yoga, Ziplines. Recently our friends came to Sayulita and stayed here at Villa Amor and loved it so I decided to follow their advice and also booked a stay. What a wonderful place! Villa Amor is nestled right on the water on the south side of Sayulita and part of what makes it so special is that you’re on the ocean but not “in” the touristy beach area that’s literally a 5-7 minute walk away. Within minutes you’re in the mix of a variety of amazing shops, cafes and restaurants (check out Don Pedro's on the beach for their Tuna Tostadas, Grilled Octopus Greek Salad and their Red Beet Ravioli was mouth watering. Mary’s was our favorite for local cuisine and the most delicious tacos and mole around). The gran villa was spectacular with incredible ocean views and the staff even more so. They were exceptionally warm welcoming and went beyond the call of duty to help us with any questions or suggestions when it came to excursions, beaches or dining. From the moment I booked online they were there to help in every way before and during our stay. I can’t say enough about how wonderful, attentive and accommodating the staff is here. I could go on and on but I’ll leave it at this... book your stay at Villa Amor. I promise you will not be disappointed. Thank you everyone here for making our vacation an enjoyable, seamless and memorable one! We will definitely be back! This was our second time staying at Villa Amor. This time we brought 50 friends and family with us. Everyone had a great experience! Perfectly situated on the curve of town looking back at main beach and main town square are. Rooms are very nice and each have their own unique qualities. We love the Serena for its outdoor lounging area and air conditioned bed and bathroom. The restaurant/bar on site, while not affiliated directly with Villa Amor, serves great breakfasts at a great location. Karen, the Villa Amor wedding planner, put on our wedding. We couldn't have been happier with the end result. The venue (Beach wedding), organization, and details were all perfect. It is tough, at times to place all of your trust in a planner so far away, but Karen was great and our wedding was perfect. All of the staff were really helpful, but I wanted to single out Ricardo. He was awesome. He made sure everything anyone in our group needed was taken care of. He did the same on our first visit last year. La Gran Villa was such an extraordinary experience! The luxurious and spacious villa opens up to the most amazing views of Sayulita. The rooms are spacious with their own bathrooms and AC. The main living room is a wonderful open space that flows to the kitchen and has huge sliding doors to the view, the patio and the pool and spa! The Villa sits upon a promontory away from it all overlooking Sayulita’s perfect crescent beach. It’s a commanding and inspiring place to be. Everything is walkable but we did rent a golf cart which made getting around town fun and gave us more time to get back to lounge in the infinity pool and jacuzzi and watch the sunsets. At the bottom of the steps that lead from the villa to the beach is the O Restaurant — great breakfast, lunch and dinner right on the water with perfect Mexican food and the freshest fish you’ll have anywhere. Mornings are so peaceful…the pastel pink and orange sunrises, the calm ocean waves crashing below, the waking chirps of the birds ALL became part of my morning yoga practice right there on the patio and part of me forever. This place is GOOD for the soul! In our fast paced lives to have a place where we can stop, slow down and breath in this kind of beauty is priceless AND when you add a margarita and that CRAZY VIEW ...it’s pure BLISS! I was married on the patio at La Gran Villa this weekend but wedding aside (which was amazing), just focusing on the room... WOW. The villas are stunning. The furniture was all new from when I visited a year ago but I also believe prices have since increased. For 15 people between the 2 villas, each person paid 150 per night, per person. They were a bit hesitant but once they saw the room they agreed it was worth every penny. There all LOTS of stairs. We rented 2 golf carts to go around the back way but couldn’t figure it out so we just had the front desk call us a cab when my mother in law needed assistance but us 20/30 year olds were fine. Concierge, housekeeping and the room service staff were all great. If you have a large group, this is THE place to be! For the wedding, the vendors who set up and catered the meals were incredible. This was the best food we have ever eaten at a wedding. Excellent servers and bartenders. Our guests were constantly entertained that evening. The set up was also perfect. We watched it slowly being put together a day before, but the moment we set foot on the courtyard to meet each other for our first look, we were greeted to a fully set up reception, better than imagined or planned. In my opinion, La Gran Villa is the perfect place to relax and enjoy. The Villa Amor property is right in front of the beach, so you get to listen to the sound of the waves and to smell the ocean breeze; the staff is great, they are all so nice and humble. Also the guys at the reception are extremely nice, they always receive you with a bright smile. You’ll love this place from the moment you enter to the town. I just stayed at Villa Amor in November and already I cannot wait to go back. I truly can't say enough about the staff here. I had my wedding here so over the almost 2 years of planning, I had the opportunity to work with several members of the staff. If you're thinking of Villa Amor for your wedding destination, please don't hesitate. Just do it. Karen is incredible. I will admit that I had a hard time letting go and trusting that she would make my wedding everything I envisioned. She exceeded anything I had envisioned! It was the most gorgeous wedding. Everything was perfect. But about Villa Amor and the staff... I personally had 3 villas during my stay. We stayed in La Gran and Serena and we rented Tesoro for our kids and babysitters. Each villa was perfect. The view from Tesoro was beautiful. It is just steps from the pool which was great for the kids and babysitters. Serena was just easy. No steep hills to climb, a great view, beautiful outdoor space. And La Gran!!!! Stunning. Worth every single stair that had to be climbed to reach it. I also had the opportunity to check out out several of the other villas that my wedding guests rented. I would have stayed in any of them! And the staff! Jesse from the front desk carried a crib all the way up to La Gran for me. Until you stay here you won't understand the huge deal that this was- 161 stairs in 100 degree weather. Ricardo was our hero on this trip. My husband lost his phone on day 2 of our trip but Ricardo was able to hunt it down. Talk about saving our trip! Carlos at the bar had my husbands drinks ready the second he saw he walk up. Villa Amor was the best decision we made in planning our wedding. Not only was the wedding incredible but we found a hotel and a location that we will always treasure and want to return to. Our wedding planner- Karen Ruezga, was incredible! She went above and beyond to make our big day and stay at villa amor perfect. Everything was beautiful and the staff at villa amor are so incredibly friendly. We really felt at home at the villa amor and would highly recommend it to anyone planning a wedding or just a vacation. As for Villa Amor- the hotel was also so wonderful. Not only is this place so beautiful, the customer service is incredible and the staff are so friendly and always willing to help! We will stay at Villa Amor for more times to come. Thank you! You will be amazed by the view from our balcony. Every morning we lay in our lounge chairs and watch the sunrise and the surfers. And in the evenings look over the town with all the lights. Ocean view we saw dolphins. All prices are in US dollars and do not include 3% state lodging tax. Accommodating additional guests must be arranged in advance at an additional charge. Please utilize the contact information box for booking inquiries, either by email or telephone. Our reservation specialists are happy to assist you with planning your perfect stay. Reservations subject to availability. Our specials are subject to change without notice. Please view our Wedding and Event Venue page for more information regarding destination weddings and special events at Villa Amor. Option 1: Receive a refund minus the cost of one night per villa less fees (3% tax and 4% bank commission). Option 1: 50% refund less fees (3% tax and 4% bank commission). Opción 1: Reciba un reembolso menos el costo de una noche por villa menos cargos (3% ISH y 4% comisión bancaria). Opción 1: Reembolso de 50% menos cargos (3% ISH y 4% comisión bancaria). ó un rembolso del 25% menos cargos (3% ISH y 4% comisión bancaria).